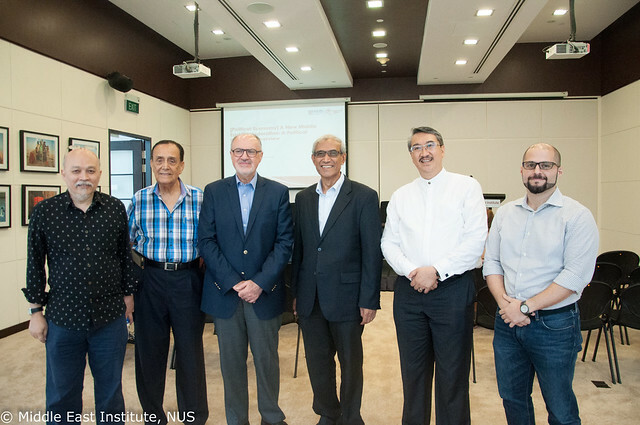 (This event was jointly organised by MEI’s Political Economy Research Cluster and the Islamic Religious Council of Singapore (MUIS).Former Iraqi minister Ali Allawi last week said Middle Eastern countries should start thinking about a future where economic opportunity replaces conflict. To do that, they have to tackle an issue Singapore is familiar with: Water. In a talk at MEI, Dr Allawi said the region faces a “very serious water crisis”, and proposed a network of canals and such to form what he called a “greenway” to overcome the problems. Ali A. Allawi is a writer, biographer and former Iraqi minister. He received his education at the Massachusetts Institute of Technology and at Harvard University. He served in the World Bank group for a number of years before founding his own investment firm. Following the changes in Iraq in 2003, he served as the Minister of Trade, and then the first civilian Minister of Defence. In 2005, he was elected to the Constituent Assembly of Iraq and then served as Minister of Finance. In 2007, he left public service to pursue scholarly and academic interests. He has authored four books, including The Occupation of Iraq (Yale: 2007) and The Crisis of Islamic Civilisation (Yale: 2009). His book Faisal I of Iraq, published in 2014, is the first comprehensive biography of this seminal figure, and is set against the fall of the Ottoman Empire and the founding of the state system in the Middle East. At various times, Mr Ali Allawi has been associated with Oxford University (Senior Associate Member); University of Exeter (Fellow); Princeton University (Fellow); Harvard University (Fellow); and the National University of Singapore (Visiting Professor). He has made numerous media appearances, and his articles and essays have appeared in major international journals and newspapers. He is the recipient of several public policy and diplomacy awards, and his books have garnered several prizes. He is currently working on a book on the economic history of the modern Arab/Islamic worlds.